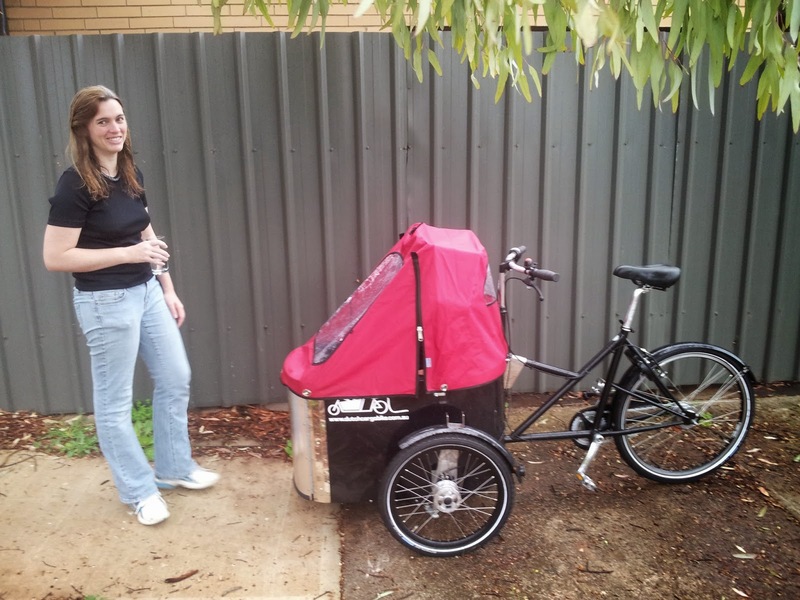 Last weekend was the Adelaide Cargo Bike Party, which unfortunately I wasn't able to get to. After his visit, we arranged to leave the Nihola trike here for me to try out, since I have never ridden a cargo trike in anger, and wanted to get a sense of what they are like to ride. 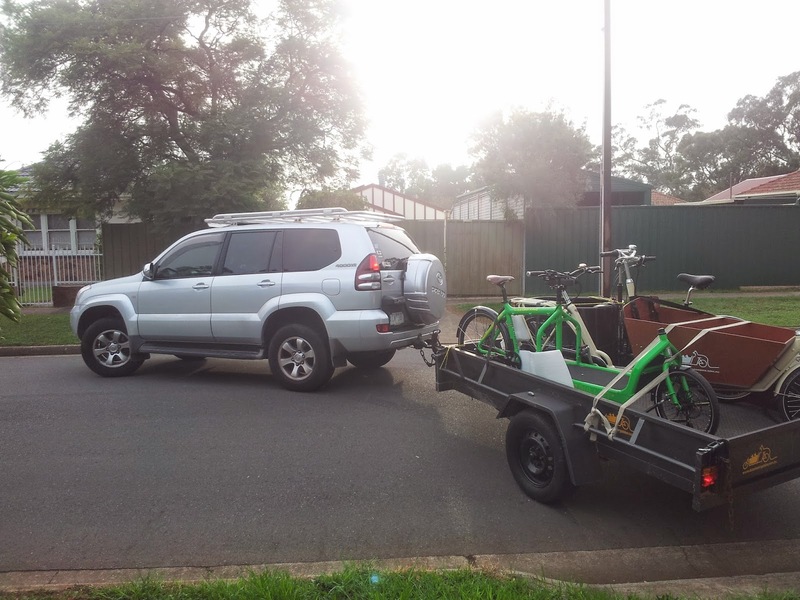 This was a bit of deja vu for me, because when I first thought about getting a cargo bike I was thinking of one of the big trikes because it would fit more. I can't remember if it was Jurgen or someone else who wisely counselled me that if I could ride a bike, then I really didn't want a trike. I was now about to put this theoretical knowledge to the test. 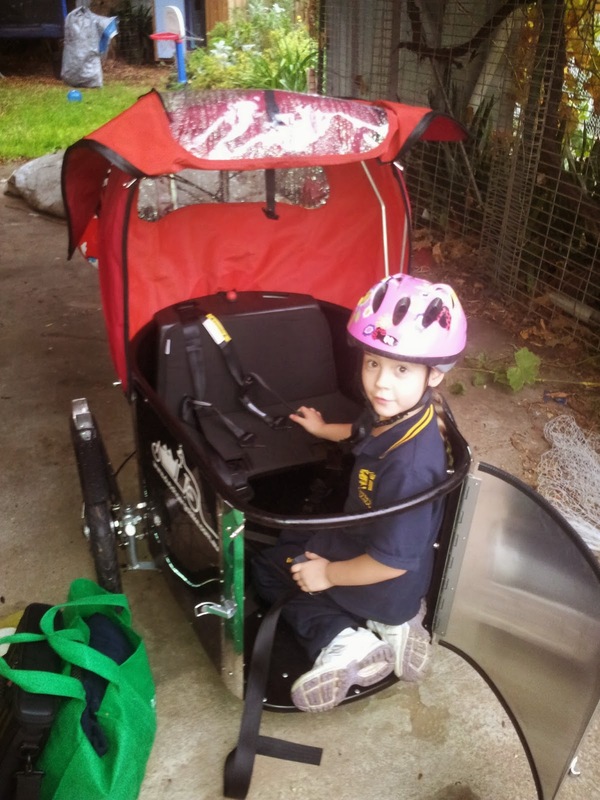 The door is great for very little kids who are too small to climb into something like the bakfiets unassisted. 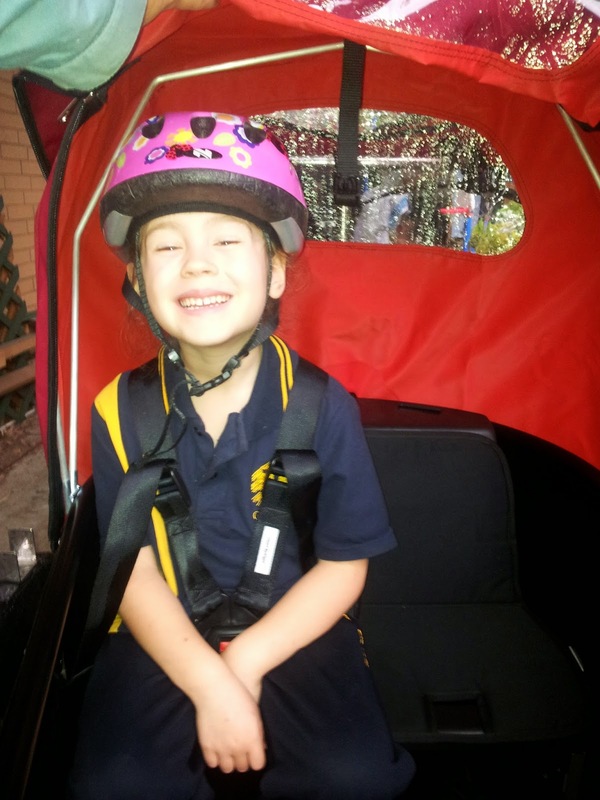 You do have to be a bit careful, as with a larger child, the trike may tip forward. It won't tip far because of the geometry, however, this does mean that your back wheel is now off the ground. This means if you are using the frame-mounted lock as a parking brake that the trike may now try to roll away if you are on a slope. It does have a "hand-brake" function on the brakes on the two front wheels that locks the rim brakes on and provides some protection against this, but it isn't perfect. It was rainy, so the weather cover got a good test. 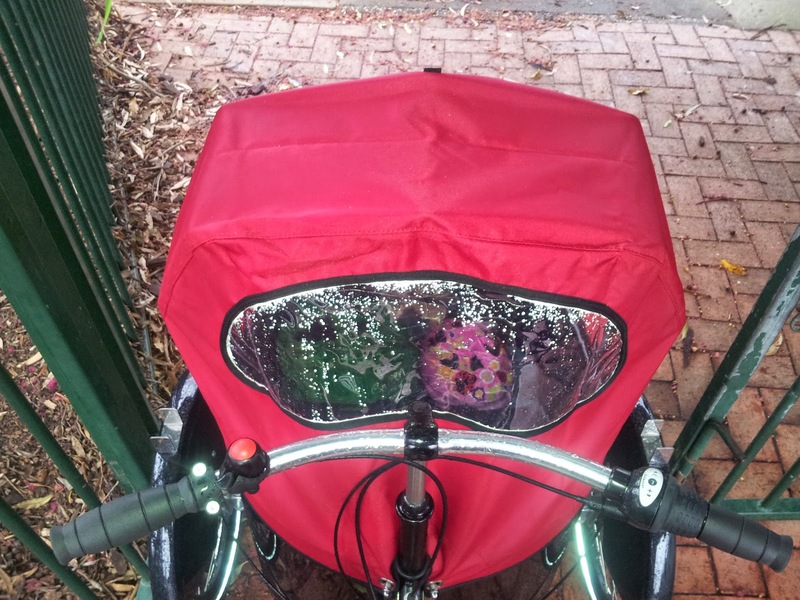 Little miss loved the extra headroom compared to the rain shield we have on our bakfiets (there is now apparently a higher rain shield for the bakfiets, and we will very likely get one -- expect a post when that happens). The generous head room is a real plus here in Australia where we need to wear helmets when riding. Here we are fully loaded. There is a deceivingly large space under and behind the seat for putting loads of stuff. The next test before departure was for my wife to take a look at it. She has yet to hop on a cargo bike herself. She immediately saw how much shorter, and thus more manoeuvrable the Nihola is. Other people throughout the day commented on how fantastic and fun it looked. It is also quite a bit easier to move around when walking. This is in part because you can pick the back up and swing it around (that tilting forward problem becomes a feature here), something that is quite a bit harder on our long bakfiets. At low speed, the trike is really nice to handle, and does indeed have a tighter turning circle. 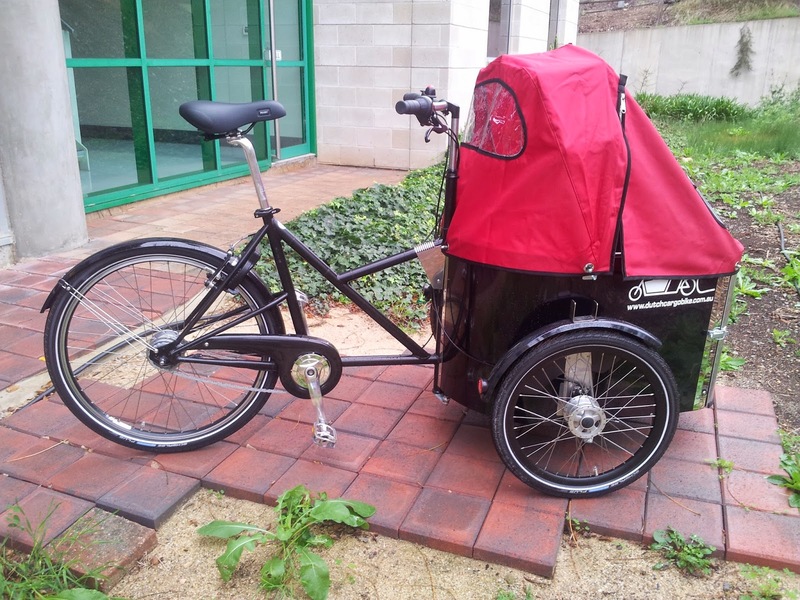 Compared to many other trikes, the Nihola has steering like a car, where the wheels turn, and the box stays stationary. This is really helpful, as you can't end up with box at a horrible angle to the back when turning a corner, which is a common way for trikes to roll over. The risk of rolling over or generally throwing you off is a good reason to not get a trike if you can ride a bike, as all trikes have this risk, and the risk increases greatly with speed. 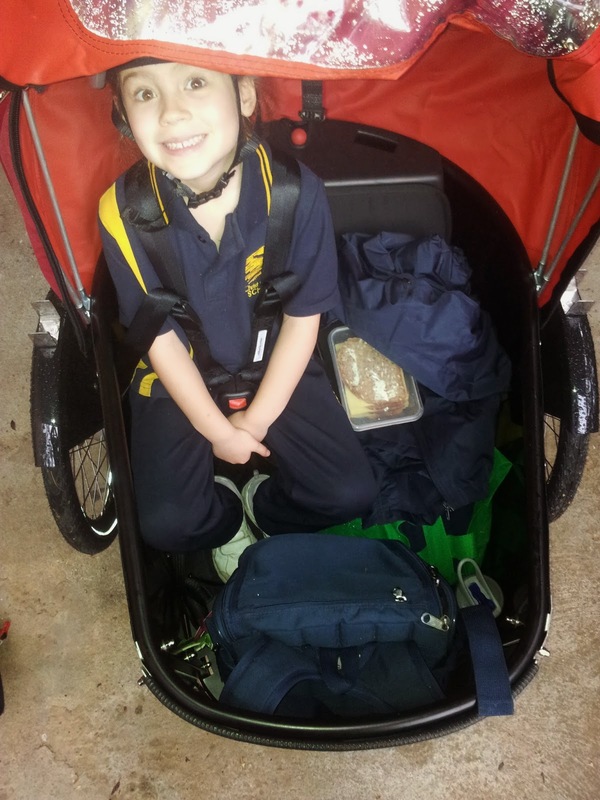 Pootling along to school was fairly comfortable, although I did immediately notice how trikes, especially tadpole configuration trikes with the two wheels at the front want to follow the camber of the road into the gutter. You have to set a noticeable angle of attack towards the middle of the road to keep straight. Then potholes and other obstacles will try to divert you. At higher speeds, like around 20km/hour and above, the handling gets quite unsettling, simply because it is a trike. My wrists got tired and a little sore just trying to keep it going straight on the various turns and strangely angled roads on the way to work. It should be said that I work at Engineering at Flinders University, so this included riding it up Ring Road, which has some quite unpleasantly cambered corners. I am sure that my wrists would toughen up if I did it regularly. Being able to stop at lights without having to balance the bike was very nice. Also, not having to balance meant I could pedal even slower than normal up the hill to work, which was very welcome on the 10% grade sections. That just left riding home. Now that was an interesting experience. 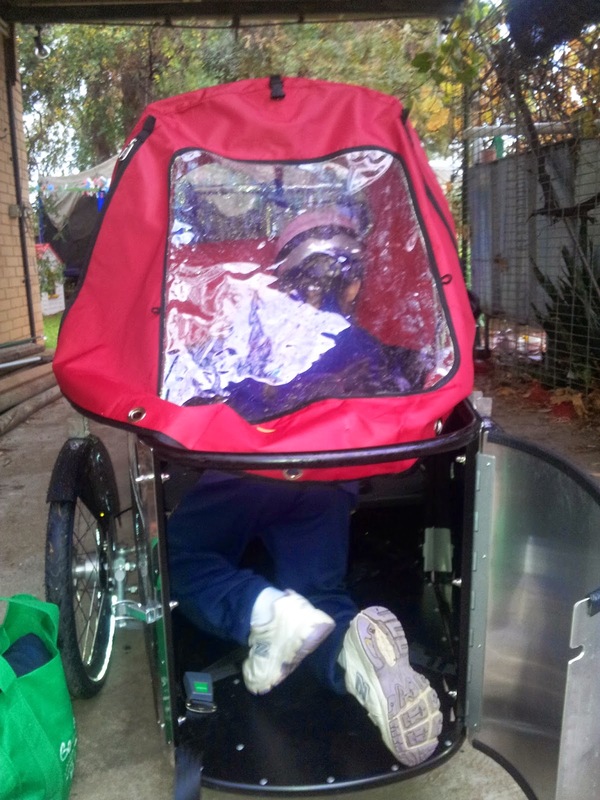 I normally do the ride down Ring Road at close to the 50km/hour speed limit in the bakfiets, without trouble or feeling out of control or at all unsafe. Goodness me riding a trike down that hill is a very, very different experience, and not one that I want to repeat in any hurry. I was in and amongst the afternoon peak-hour traffic leaving the University, and the trike is just a bit too wide to keep left enough to let cars go past easily. So I had the real sensation that I was holding up the traffic. The natural tendency of trikes to follow the slope of the road was a much greater problem, and to control this I had to brake the whole way, and try to keep below about 20km/hour. Turns against the camber can only be made at very low speeds, and I ended up missing my usual turn onto Flinders Drive because I couldn't safely take the turn. That left me with the unenviable task of riding the trike down the weavy and strongly cambered Ring Road and University Drive towards Sturt Road. I managed to stay in the left car lane, but only just, and only with a lot of work. I feel sorry for the poor traffic behind me as the trike tried to take me into the right-hand lane on several occasions. You really have to be watching the sideways slope of the road ahead and managing the angle of attack quite intensely with a trike on this kind of road. All up it took me probably 75% longer to get home than with the bakfiets. So after my adventure, what do I think of the Nihola and trikes in general? Regarding trikes, I would repeat the wisdom given to me two years ago: Go for a two-wheeler unless there is some reason why you really can't. Two-wheelers handle better, especially at any credible speed, and on cambered roads. Of course, if you can't balance, only go short distances at low speed or have some other reason why a trike meets your need, then they fine. As for the Nihola specifically, I haven't ridden other trikes. However, I do know enough about the normal tadpole trike configuration that having the wheels turn and keeping the box and rear of the trike in line makes the thing a whole lot safer, and it really won't tip in normal conditions, provided that you keep below about 15km/hour. 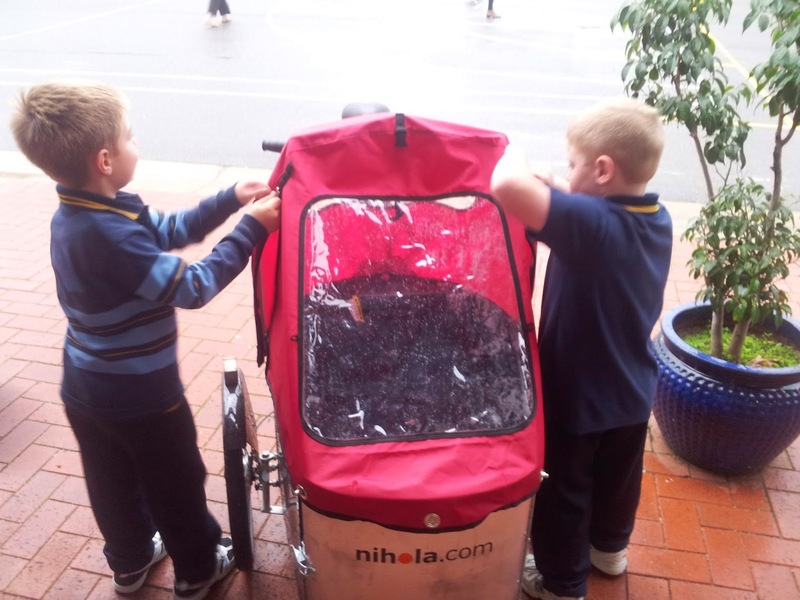 So in short, my feeling is that the Nihola is one of the best trikes on the market, is really nicely made, and the kids loved riding in it, but it is still a trike -- and that introduces some serious limitations. Is an awesome very informative movie about the Nihola! Glad the information can be useful. 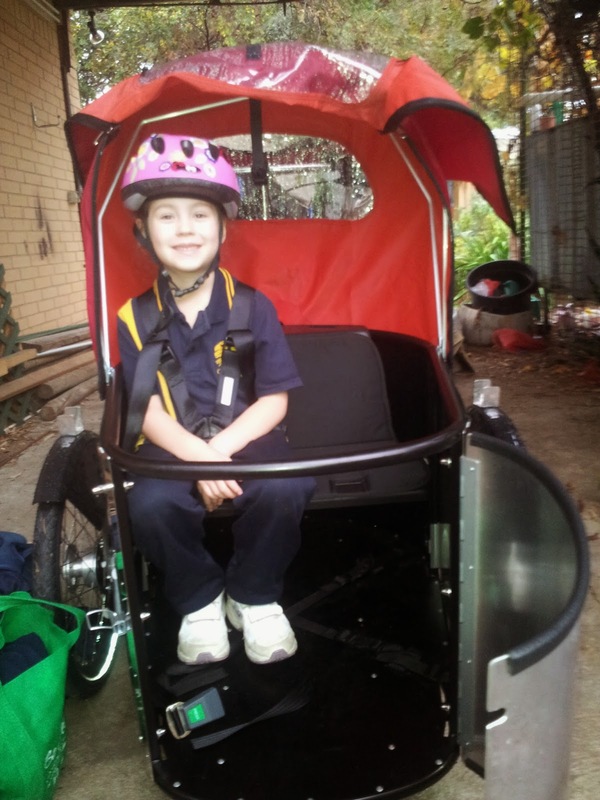 We have also just electrified our bakfiets this past week or so, so if you would like to try it out, poke me by email. Thanks for the write-up on the Nihola. I've been wanting to get one for ages. I used to ride casually years ago and since getting my dog (whom I take with me everywhere) I don't ride as I can't take her with me.